The Focke Wulf design team is remembered for many different innovative designs, especially the potent Fw 190 fighter series. 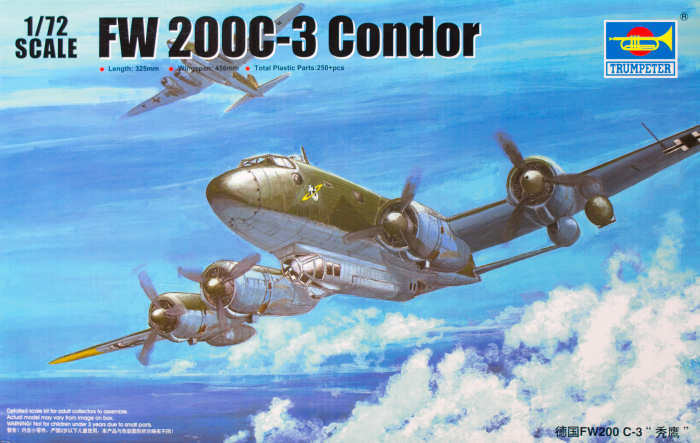 One aircraft off their drawing boards that is sometimes overlooked is their four-engined airliner, the Fw 200 Condor. This aircraft entered service in the mid 1930s with Lufthansa, helping Germany to add air routes and service throughout Europe and beyond. When Germany initiated its campaign of expansion, many commercial aircraft were adapted to serve in Luftwaffe service. As a VIP transport, the Fw 200 was clearly suited for the role. Of the various other tasks given the aircraft, one of the more common roles was maritime reconnaissance. The Fw 200C-3 and Fw 200C-4 were made to order. The Fw 200C-4 was the version built in the largest numbers. For maritime reconnaissance, the aircraft was modified with additional fuel cells in its main cabin to provide the endurance to patrol deep into the Atlantic in search of Allied shipping. Serving mainly with KG 40, these maritime reconnaissance aircraft were armed with underwing bombs and a radio to call in reinforcements. Deja-vu all over again. 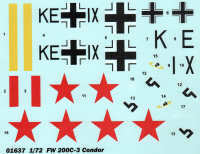 It was over eight years ago that we had a look at Trumpeter's (huge) 1/48 scale Fw 190C-4 kit. 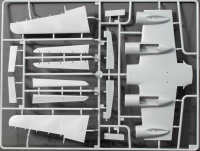 Trumpeter had announced a scaled-down version of this tooling - in 1/72 scale - a few years after the larger kit hit the market and like the long-awaited 1/32 A-6 Intruder, this kit has finally arrived on store shelves. The good news and the bad news is that it is a scaled down 1/48 scale kit. So being a scaled down 1/48 scale kit, this is easily the most detailed kit of this aircraft in this scale though it will be more work to finish than the venerable Revell kit. With all of the interior details provided in this kit, you'll be a bit challenged to see these after assembly as that will be nearly impossible through the side windows and a small rear compartment will be visible through the rear dorsal gunner's station. In short, the kit is over-engineered, but the AMS modeler can still make some good use of these features with some careful surgery to open the main entry doors. My sincere thanks to Squadron/MMD and Stevens International for this review sample!